In 10-inch skillet, break up sausage and cook over medium-high heat 6 to 8 minutes, stirring occasionally, until no longer pink. 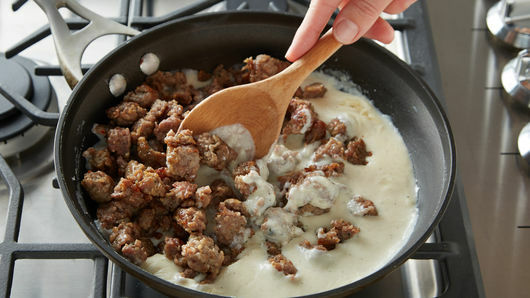 With slotted spoon, remove sausage from skillet to small bowl; set aside. Decrease heat to medium. Add butter to drippings in skillet; cook until butter is melted. Add flour and pepper; cook about 1 minute, stirring constantly with whisk, until no lumps remain. Slowly add milk; cook 1 to 3 minutes, stirring constantly, until mixture is thickened. Stir in cooked sausage. Spray 5- to 6-quart oval slow cooker with cooking spray. Separate dough into 8 biscuits. 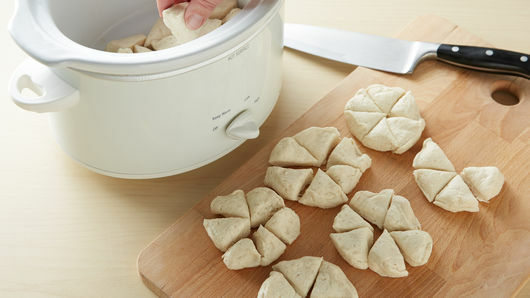 Cut each biscuit into 6 pieces; place in slow cooker. Cook on Low heat setting 2 hours to 2 hours 30 minutes. Insert paring knife into center of casserole to make sure biscuits are fully baked; outer edge will be deep golden brown. Top with green onions before serving. 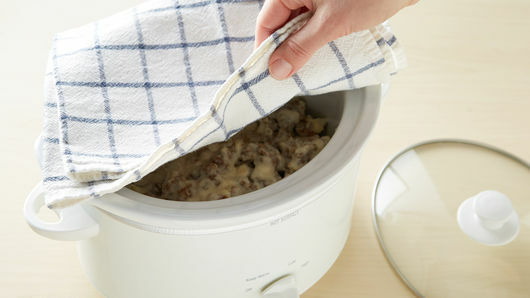 If serving a crowd, keep slow cooker on Warm heat setting up to 15 to 30 minutes, to keep heated through as guests serve themselves. 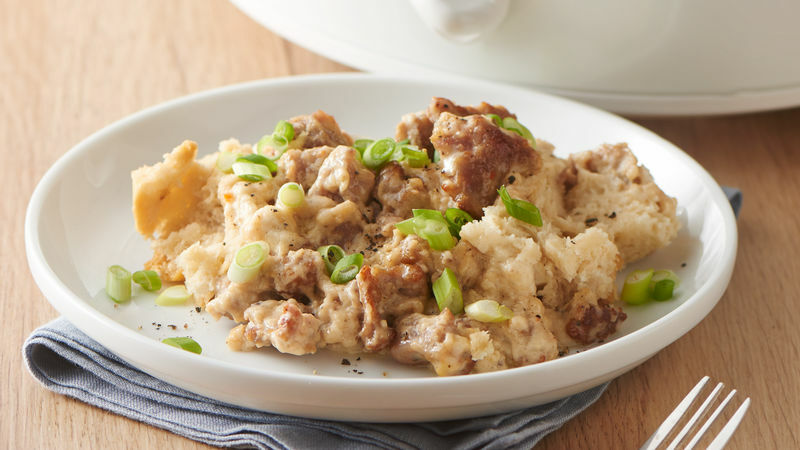 An oval slow cooker is the best option for ensuring biscuit doneness. Hot and spicy bulk pork breakfast sausage is a nice option for those who prefer extra heat.